The U.S. economy has reached a milestone according to the latest employment numbers, released last week. The national economy added 217,000 jobs in May — a solid monthly figure — which puts the nation back to its pre-recession peak from January 2008. After bottoming out in early 2010, the economy has slowly added jobs, taking over four years to recover the number of jobs lost in just two years. We can’t celebrate here in Kansas City just yet though. 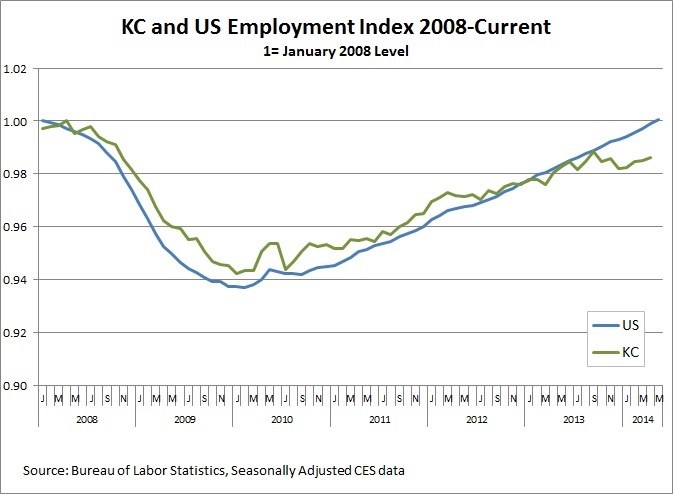 KC has followed the same the same slow path to job recovery, but we are still about 14,000 jobs below our pre-recession peak from April 2008. Judging by our current growth rates, we estimate that we are still about a year away from regaining all the jobs lost in the regional economy.